The development of new cutting-edge low-carbon technologies is a crucial part of an effective response to the global energy and climate challenge. The urgency of climate change requires new technological advances that could reduce greenhouse gas emissions and improve sustainability of the energy system. While important progress has been made in developing clean energy solutions in recent years – particularly in the use of renewable energy sources – fossil fuels and unsustainable use of natural resources still vastly dominate the global energy landscape. In order to accelerate the global transition to sustainable energy system, the pace of innovation and deployment of clean technologies have to remain full-spread or even increase. Today, hundreds of scientist, engineers and entrepreneurs around the world are working on new technologies that could reduce CO2 emissions and improve the global energy mix. The purpose of this article is to highlight new ideas and technological breakthroughs developed in different countries that could limit the impact of climate change and provide affordable and sustainable energy to everyone. Carbon capture and storage (CCS) is the process of capturing waste carbon dioxide (CO2) from large point sources, such as fossil fuel power plants, transporting it to a storage site, and depositing it where it will not enter the atmosphere, normally an underground geological formation. The aim is to prevent the release of up to 90% of CO2 into the atmosphere (from fossil fuel use in power generation and other industries). Because CCS can achieve significant CO2 emission reductions, it is considered a key option within the portfolio of approaches required to reduce greenhouse gas emissions. The following technological breakthroughs are an important step towards competitive carbon capture solutions. Carbon Engineering is a Canadian start-up developing a technology, which enables to capture carbon dioxide directly from the atmosphere and use it in different industrial applications. 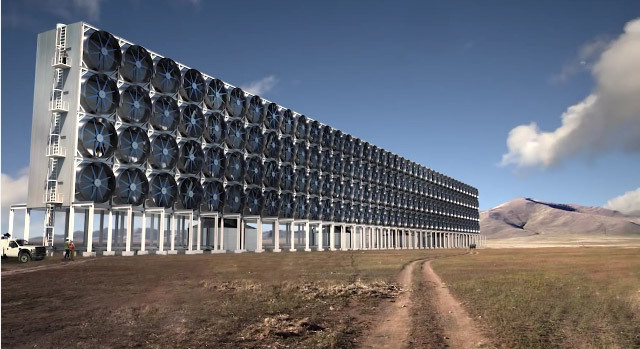 Carbon Engineering’s Direct Air Capture system integrates two main cycles. The first cycle is the absorption of CO2 from the atmosphere in a device called an “air contactor” using an alkaline hydroxide solution. The second cycle regenerates the capture liquid used in the air contactor, and delivers pure CO2 as an end product. These cycles operate in tandem continuously, producing a concentrated stream of CO2 gas as an output, and requiring only energy, water, and small material make up streams as inputs. Energy is used in such a way that no new CO2 emissions are incurred, and thus do not counteract what was captured from the air. The captured atmospheric CO2 can be stored underground, used for enhanced oil recovery, or turned into low-carbon synthetic fuels. Climeworks is a Switzerland-based company that was spun out of ETH Zurich. The company provides an ecologically and economically attractive method of CO2 extraction from ambient air. The Climeworks CO2 capture technology is based on a cyclic adsorption / desorption process on a novel filter material (“sorbent”). During adsorption, atmospheric CO2 is chemically bound to the sorbent’s surface. Once the sorbent is saturated, the CO2 is driven off the sorbent by heating it to 95 °C, thereby delivering high-purity gaseous CO2. The CO2-free sorbent can be re-used for many adsorption /desorption cycles. The beauty of the process is the fact that around 90% of the energy demand can be supplied by low-temperature heat; the remaining energy is required in the form of electricity for pumping and control purposes. Climeworks is now building their first industrial-scale plant for capturing carbon from the atmosphere that will be operational by 2016. 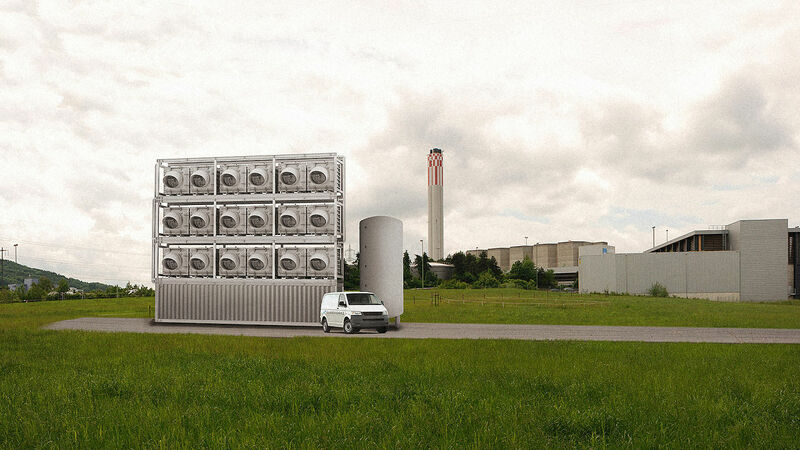 The company says that the plant, which is located in Hinwil, Switzerland, will be able to capture 900 tons of carbon dioxide from the atmosphere each year. The plant will be the first in the world to sell captured atmospheric carbon dioxide to a customer – a nearby greenhouse, which will use it to enhance the growth of its vegetables by up to 20 per cent. A new, highly permeable carbon capture membrane developed by scientists from the U.S. Department of Energy’s Lawrence Berkeley National Laboratory could lead to more efficient ways of separating carbon dioxide from power plant exhaust, preventing the greenhouse gas from entering the atmosphere and contributing to climate change. In a first, the scientists engineered the membrane so that carbon dioxide molecules can travel through it via two distinct channels. Molecules can travel through the polymer component of the membrane, like they do in conventional gas-separation membranes. Or molecules can flow through “carbon dioxide highways” created by adjacent metal-organic frameworks. Initial tests show this two-route approach makes the hybrid membrane eight times more carbon dioxide permeable than membranes composed only of the polymer. Boosting carbon dioxide permeability is a big goal in efforts to develop carbon capture materials that are energy efficient and cost competitive. Researchers in the School of Chemistry and Chemical Engineering at Queen’s, along with colleagues at the University of Liverpool and other international partners, have invented the new liquid and found that it can dissolve unusually large amounts of gas, which are absorbed into the ‘holes’ in the liquid. The three-year research project could pave the way for many more efficient and greener chemical processes, including carbon capture. To prepare the porous liquid, the researchers took rigid organic cage molecules—each of which defines a molecular pore space—and dissolved them at high concentration in a solvent that is too large to enter the pores. As a result, the pores in the cages remain empty and available to solutes. The concentration of unoccupied cages can thus be around 500 times greater than in other molecular solutions that contain cavities, resulting in a marked change in bulk properties, such as an eightfold increase in the solubility of methane gas – one of the most damaging greenhouse gasses. Carbon utilisation technologies could go a step further by using the CO2 in industrial processes, rather than simply storing it. The CO2 has potential uses in the manufacture of synthetic diesel, biofuels, solvents and polymers and other biological and chemical processes. Given the likelihood that we will continue to rely on fossil fuels for some significant time to come, carbon dioxide utilization has the greatest potential to contribute to the reduction of greenhouse gas emissions. Liquid Light is a New Jersey-based star-up born in Princeton lab that develops an electrochemical process technology to make chemicals from carbon dioxide. The company says its technology can be used to produce more than 60 chemicals, but its initial focus has been on ethylene glycol, which represents today a $27 billion market. The main advantage of Liquid Light’s process is its potentially lower feedstock costs. If electricity is provided by natural gas, nuclear, or renewable sources, Liquid Light’s process could also have lower carbon emissions than conventional methods. Liquid Light recently signed a technology development agreement with The Coca-Cola Company to accelerate the progress of its CO2 to mono-ethylene glycol (MEG) conversion technology. MEG is one of the components used to make Coke’s plant-based PET plastic bottle. Newlight was founded in 2003 with a question: why can’t we use greenhouse gas emissions as a resource to make materials? After 10 years of research and development, Newlight has commercialized a carbon capture technology that combines air with methane-based greenhouse gas emissions to produce a plastic material called AirCarbon – a thermoplastic that can be shaped into many things and has the performance properties of petroleum-based plastic. It has been made into hard, durable casings, as well as thin films and bulky furniture. Typically, plastic is made by exposing hydro­carbons from fossil fuels to tremendous pressure and energy. Newlight’s first commercial plant, in California, captures methane generated by a dairy farm’s waste lagoon and transports it to a bioreactor. There, enzymes combine the gas with air to form a polymer. The resulting plastic (AirCarbon), performs identically to most oil-based plastics but costs less—creating a market-driven solution to global warming. Recently such companies as Dell and Ikea started to purchase AirCarbon plastics. IKEA and Newlight Technologies have entered into a supply, collaboration, and technology license agreement that will supply IKEA with Newlight’s AirCarbon and enable IKEA to produce AirCarbon thermoplastic under a technology license. Dell has turned to Newlight’s AirCarbon for a pilot project focusing on focus on packaging, specifically for the protective bags for Dell Latitude notebooks shipped to the U.S. and Canada. Novomer is an emerging sustainable chemistry company commercializing a family of sustainable polymers and chemicals produced using CO2 and CO as feedstocks via proprietary Novomer catalysts. Novomer is positioning its new polymer technology to compete with conventional petroleum-based raw materials across a diverse range of applications, including flexible, rigid, and microcellular packaging foams, thermoplastics, polyurethane adhesives and sealants, and coating resins for food and beverage cans. Plastics are carbon-based materials composed of one or more building blocks strung together into long chains called polymers. Conventionally, the building blocks, called monomers, are formed by distilling crude oil and “cracking” its large carbon molecules into small, two-carbon molecules. These small molecules are then used to create an array of commercial plastics including polycarbonate plastics. The Novomer process reduces the use of these fuels by replacing up to half of the mass of the petroleum-based product with CO2. Novomer’s process extracts carbon molecules from carbon dioxide, which can be harvested from industrial processes. Depending on the feedstock and catalyst, Novomer can vary the output. For example, the CO2-containing polymers can be tailored for applications with a broad range of material characteristics from solid plastics to soft, flexible foams, depending on the size of the polymer chain. A team of materials scientists at the Hefei National Laboratory for Physical Sciences in Hefei, China, have just developed a new material that transforms carbon dioxide gas into a simple, clean-burning fuel called formate. Using a process called electroreduction, their work requires nothing more than a modest amount of electric current. The new material is a four-atom thick sandwich of cobalt metal and cobalt-oxygen molecules. On the molecular scale, here’s a simple version of how the new material works: When pulsed with electric current, the material interacts with CO2 molecules running through it. Bascially, a hydrogen atom (which has one electron and one proton) gets attached to the carbon atom of the CO2 molecule. When that happens, an extra electron is flung into one of the oxygen atoms in the carbon dioxide. With that, the CO2 becomes CHOO−, or formate. If produced for large application, the new material material could stretch to turning regular power plants into what we might call double or second-hand power plants: after the first stage of power production is complete, the new material would then turn the CO2 byproduct into a completely separate fuel source. A team of University of Texas at Arlington chemists and engineers has proven that concentrated light, heat and high pressures can drive the one-step conversion of carbon dioxide and water directly into useable liquid hydrocarbon fuels. This simple and inexpensive new sustainable fuel technology could potentially help limit global warming by removing carbon dioxide from the atmosphere to make fuel. The researchers demonstrate that the one-step conversion of carbon dioxide and water into liquid hydrocarbons and oxygen can be achieved in a photothermochemical flow reactor operating at 180 to 200 C° and pressures up to 6 atmospheres. Concentrated light drives the photochemical reaction, which generates high-energy intermediates and heat to drive thermochemical carbon-chain-forming reactions, thus producing hydrocarbons in a single-step process. The scientists envision using parabolic mirrors to concentrate sunlight on the catalyst bed, providing both heat and photo-excitation for the reaction. Excess heat could even be used to drive related operations for a solar fuels facility, including product separations and water purification. Biofuels are transportation fuels derived from agriculture, forestry or other organic feedstocks. Bio-ethanol and bio-diesel are currently the most common biofuels used in transport, although other biofuels are also in use, such as pure vegetable oil and biomethane. The main drivers for the production and use of biofuels are the security and diversification of energy supply, reduction of oil imports and dependence on oil, rural development and the reduction of greenhouse gas (GHG) emissions. 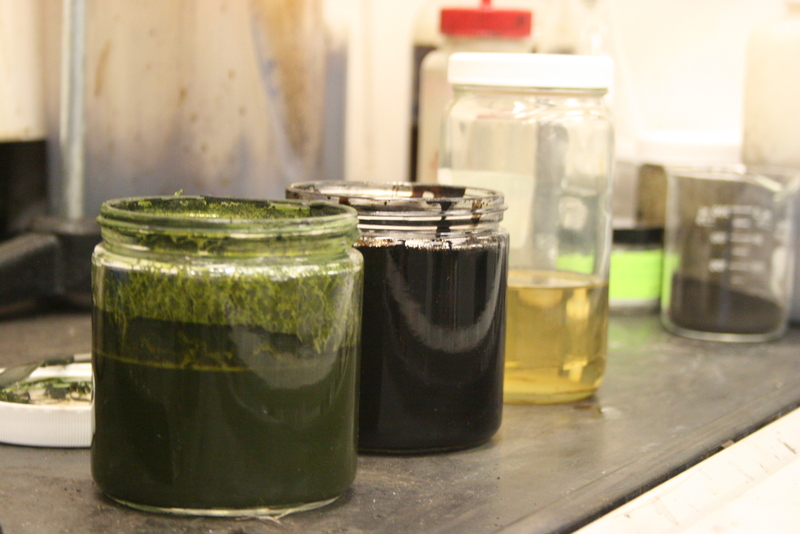 Researchers at Pacific Northwest National Laboratory (PNNL) have created a continuous chemical process that produces useful crude oil minutes after they pour in harvested algae — a verdant green paste with the consistency of pea soup. In the PNNL process, a slurry of wet algae is pumped into the front end of a chemical reactor. Once the system is up and running, out comes crude oil in less than an hour, along with water and a byproduct stream of material containing phosphorus that can be recycled to grow more algae. With additional conventional refining, the crude algae oil is converted into aviation fuel, gasoline or diesel fuel. PNNL scientists and engineers simplified the production of crude oil from algae by combining several chemical steps into one continuous process. The most important cost-saving step is that the process works with wet algae. Most current processes require the algae to be dried that takes a lot of energy and is expensive. The new process works with an algae slurry that contains as much as 80 to 90 percent water. Researchers have been able to extract usable gas from the water and then recycle the remaining water and nutrients to help grow more algae, which further reduces costs. The PNNL system runs continuously, processing about 1.5 liters of algae slurry in the research reactor per hour, an amount that’s much closer to the type of continuous system required for large-scale commercial production than systems that run a batch at a time. Photosynthesis fuels growth in plants and algae, two of the primary components of biomass. Biomass, in turn, can be converted into various fuels and chemicals. Researches from National Renewable Energy Laboratory (NREL) have shortened this process by engineering one photosynthetic organism, cyanobacterium, so that it converts CO2 directly into the target chemical ethylene, bypassing the biomass production and processing stage. Ethylene is the most widely produced petrochemical feedstock in the world and is currently produced from fossil fuels; this method of producing ethylene is the chemical industry’s largest emitter of CO2. The NREL research team improved ethylene productivity using engineered cyanobacteria so that up to 10% of photosynthetically fixed carbons become ethylene. This capability could mean a savings of six tons of CO2 emissions for every ton of ethylene produced. The CO2 savings include the three tons that would be emitted by tapping fossil fuels and another three tons absorbed by the bacteria. The French cleantech startup Cryo Pur has developed a cutting-edge technology that can produce liquid biomethane (or bio-LNG) and bioCO2 from biogas, treating agricultural, industrial, sewage sludge, and household waste. This innovative technology is based on a state-of-the-art cryogenic process enabling efficient biogas upgrading with zero methane loss and zero emission of greenhouse gases. Liquefied biogas consists of cooled and liquefied methane. Biogas condenses at a temperature of -162 C° and contains more energy per unit volume than biogas in gaseous form. The utilization of biomethane as a source of energy is a crucial step toward a sustainable energy supply. Being a 100% renewable energy source, Bio-LNG offers significant opportunities for off-grid industrial sites that, until now, have been forced to rely on energy sources that are high emitters of CO2 (propane, butane, fuel oil). It also offers a cost-effective, eco-friendly fuel solution for the transport sector, particularly heavy-duty vehicles. The system developed by Cryo Pur has also the added attractiveness of enabling a local circular economy. It allows local collectivities and businesses to produce energy from their own waste, reducing their ecological impact, dependence on fossil fuels, and generating supplementary income. Hydrogen is an energy carrier that can store and deliver energy in widely useable forms. When hydrogen is produced from non-fossil energy sources or using CO2 sequestration, there are no greenhouse gas emissions. Hydrogen can be used as fuel in gas turbines, combustion engines or in fuel cell systems, combining with oxygen to produce electricity and water. Researchers at Stanford University have developed a new way to split water into hydrogen and oxygen. This is a type of electrolysis, which is already used to generate hydrogen, but the main difference here is that it’s efficient and cheap enough to run 24 hours a day, seven days a week. The device, described in an open access paper, could provide a renewable source of clean-burning hydrogen fuel for transportation and industry. 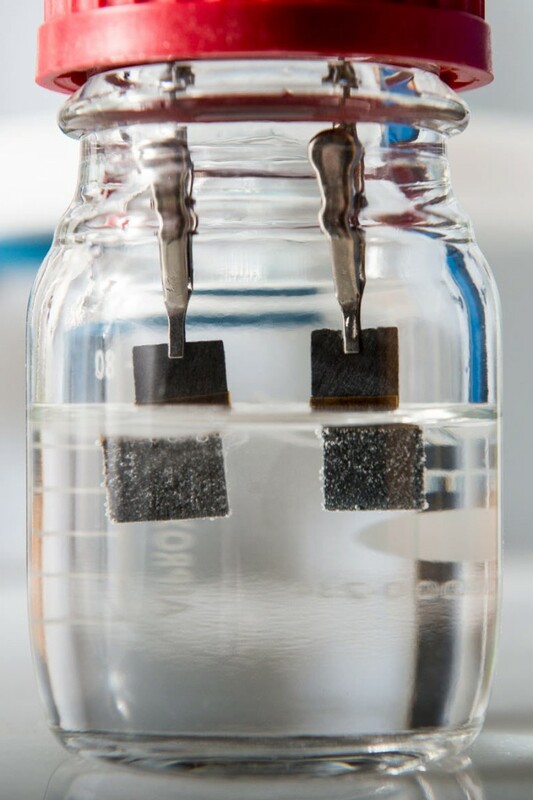 Splitting water usually requires two different catalyst materials — one for the anode and one for the cathode. This increases the cost and complexity of the system as the electrolytes need to be separated by a pH barrier of some sort to function. The new Stanford water splitter simply uses two nickel-iron oxide catalysts that can be right next to each other. When supplied with 1.5 volts of electricity, the system operates at 82% efficiency, which is far higher than traditional water electrolysis. To find catalytic material suitable for both electrodes, the Stanford team borrowed a technique used in battery research called lithium-induced electrochemical tuning. Lithium ions were used to break down the catalyst into smaller particles, which means more surface area exposed to the water and more active sites for catalyzing the water-splitting reaction. The French research institute for atomic and alternative energies CEA has developed a hydrogen production system using high-temperature steam electrolysis that is showing an outstanding performance. Designed by the CEA to limit investment and operating costs, the system achieves efficiency upwards of 90%. The system comprises a high-performance, cost-efficient cell-stack, which are at the heart of the hydrogen production reaction, together with all auxiliary components required to manage the fluid, thermal and electrical functions of the system and enable it to operate alone. This compact system, roughly the same size as a refrigerator, can produce between 1 and 2.5 Nm3/h of hydrogen. Hydrogen is already used in many sectors of industry, including chemistry, food processing, glass transformation, iron and steel manufacturing, and microelectronics. Electrolysis also shows promise for use in conversion and storage systems for intermittent renewables. Today, however, the great majority of hydrogen production processes are based on methane/natural gas reforming. The technology developed at the CEA can become an alternative process. Using a carbon-free electrical source cuts down on greenhouse gas emissions and saves fossil fuels. HyperSolar is developing a breakthrough, low cost technology to make renewable hydrogen using sunlight and any source of water, including seawater and wastewater. Unlike hydrocarbon fuels, such as oil, coal and natural gas, where carbon dioxide and other contaminants are released into the atmosphere when used, hydrogen fuel usage produces pure water as the only by-product. HyperSolar has created a self-contained hydrogen generator that can split water molecules into hydrogen and oxygen, using the power of the Sun. This technology is designed to mimic photosynthesis and contains a solar absorber that generates electrons from sunlight, as well as integrated cathode and anode areas to readily split water and transfer those electrons to the molecular bonds of hydrogen. The H2Generator will be a linearly scalable and self-contained renewable hydrogen production system, which could be installed almost anywhere in order to supply hydrogen fuel for local use. This will in turn help to solve one of the greatest challenges facing the industry – how to transport hydrogen fuel to point of use in large quantities. Each stage of the generator will be able to be scaled independently according to demand and length of storage required for specific applications, thus a small system could be used to produce continuous renewable electricity for a small house while a larger system can be used to power a community. An important characteristic of electricity is that electrical energy cannot be stored directly. Thus, the supply of electricity must be balanced continuously with the demand for it. The constant balancing of supply and demand has significant operational and cost implications. Moreover, it limits a widespread adoption and grid-integration of intermittent renewable resources, such as wind and solar into the power grid. While it is not possible to store energy in the form of electricity, it is possible to convert electrical energy to another form that can be stored. The stored energy then can be converted back to electricity when it is desired. In this way electricity storage can smooth out fluctuations in supply and can overcome mismatches between supply and demand of electricity. With recent breakthroughs in technology, energy storage can allow us to use renewable energy when and where power is needed, taking full advantage of high penetrations of sustainable energy sources. The three battery layers in the Ambri liquid metal battery are liquid self-segregating: a low-density liquid metal negative electrode; an intermediate-density molten salt electrolyte; and a high-density liquid metal positive electrode. Because of density differences and immiscibility, these active components self-segregate into three distinct layers. The materials used in the original design were magnesium and antimony separated by a salt. Now a new discovery, made by professor Sadoway and his team has shown that common calcium, which is both readily available and inexpensive, can form two parts of the three-layer liquid metal batteries: the negative electrode layer and the molten sand that separates the layers. These findings could make liquid metal battery technology more practical and affordable, and open up a whole family of potential variations that could make use of local resources. Most passenger vehicles still rely on conventional petrol or diesel engines, for which incremental improvements can be foreseen in terms of energy efficiency. Electric motors offer higher efficiency, either as battery electrical vehicles, which are purely electrical, hybrid electrical vehicles, which combine an internal combustion engine with an electric motor, or plug-in hybrid electrical vehicles, where electricity can be charged from the grid. In recent years, great progress has been made in electric vehicle industry. The most notable examples in this regard are Tesla Motors in battery electrical vehicles and Toyota in hybrid vehicles. Being already well-known to the large public, these technologies will be not covered in this article. Here we will focus on new innovative technologies that could enable wider deployment of electric vehicles. Researches from the Lawrence Berkeley National Laboratory have developed a vehicle-to-grid simulator called V2G-Sim. V2G-Sim quantifies energy use for plug-in electric vehicles (PEVs) by the second, under various driving conditions or while charging or discharging to/from the grid. The simulator enables users to predict how each vehicle will perform with different drivers, and how each vehicle will interact with the electricity grid. V2G-Sim provides a valuable research, development, and deployment platform for users to understand how different vehicles will perform for different drivers, and how different vehicles will interact with the electricity grid. Stakeholders benefiting from V2G-Sim include engineers, scientists, researchers, policy makers, analysts, and investors across the automotive industry, electricity grid industry, policy and regulatory sectors, and end users. Automotive stakeholders (including OEMs, suppliers, and aftermarket specialists, etc.) can use V2G-Sim to understand the impacts of vehicle-grid integration on individual vehicles, or on their business as a whole. Wholesale, transmission, or distribution systems operators can apply V2G-Sim to understand the impacts and opportunities from greater PEV deployment on their systems and markets. In choosing whether to buy a PEV, individual owners and fleet managers need to be certain that a given PEV model will meet their individual needs. V2G-Sim coupled with the V2G-Sim Mobile App provide this understanding for end users to ultimately accelerate the adoption of PEVs. Electric vehicles (EV) are undoubtedly a form of transport with a future, but many technical challenges have to be overcome before they replace petrol and diesel-fuelled cars. Researchers in Zaragoza, Spain are working on resolving one of the biggest problems: how to efficiently recharge batteries. The scientists involved in the EU-supported UNPLUGGED project are developing an innovative wireless charging station for electric vehicles. Unlike other systems it can charge electric cars or vans in around 20 minutes. The system works with coils that are buried under the tarmac of the charging station. It uses inductive technology, in which the coil is energized from the electric grid. When the vehicle is positioned correctly on the charging station, a connection is made between the coils and the car. The coils transfer energy to the car. The deployment of inductive charging in urban environments could improve convenience and sustainability of electric vehicles mobility. In particular, smart inductive charging infrastructure can facilitate full EV integration in the urban road systems while improving customer acceptance and perceived usefulness. The world’s oceans are veritable power houses. If we could harness the forces of their waves and tides on a large scale, they could provide a considerable amount of sustainable electric power. For example, bordering the Atlantic Ocean as well as the North Sea, Baltic Sea, Black Sea, and Mediterranean Sea, the European Union has roughly 138 000km of coastline. According to estimates, the total wave energy potential for all of these coastlines together is around 1 000 terawatt hours (TWh) per year – to put this figure into perspective, all EU countries together currently consume about 3 100 TWh of electricity per year. However, wave and tidal energy still requires substantial research and development to reach its potential. 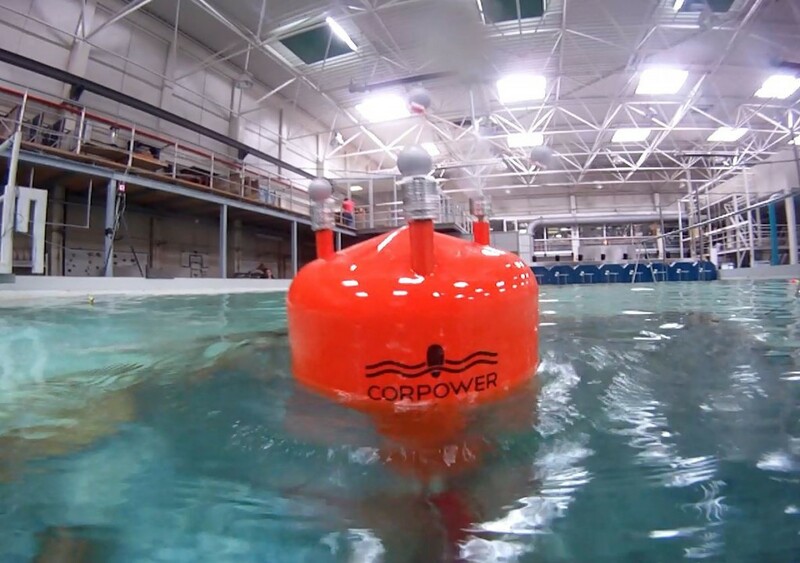 The Wave Energy Converter is expected to generate more than 8 MWh/ton of device and 6 MWh/kN PTO force, representing a step-change improvement in performance making wave power a serious alternative to other renewable sources of electricity such as wind or solar, with less variability. The dispositive allows electricity generation even in a context of light waves, facilitating thus the implementation of the system in a wide range of coast around the world. Tidal lagoons − reservoirs that stand in an estuary or close to the shore, and which fill and then empty with each tidal cycle − have now won much more favour, and one is being developed in Swansea Bay in south Wales. The worldwide potential of this technology is estimated at 80 gigawatts (GW), or the equivalent of 80 large coal-fired power stations. Tidal lagoons are a simple concept involving the adaptation of standard, proven components used in global engineering projects. The hydro turbines are mounted inside concrete turbine housings and are permanently submerged so the resulting view is of a ring-shaped harbour wall with one section of concrete casing. As the sea outside the breakwater rises and is held back a difference in water levels is created, known as ‘head’, and once a sufficient head height is reached sluice gates are opened and water flows into the lagoon through turbines to generate electricity. This process then occurs in reverse, on the ebb tide, as sea levels start to fall and a tidal head is created by holding water back within the lagoon. This way the tides can flow through our turbines four times daily to generate power. Makai Ocean Engineering has completed the world’s largest operational Ocean Thermal Energy Conversion (OTEC) power plant at the Natural Energy Laboratory of Hawaii Authority (NELHA). CalWave is developing a wave energy converter whose design is inspired by the ability of muddy seafloors to effectively absorb overpassing ocean waves. Researchers came up with the idea of using a viscoelastic carpet of wave-energy conversion (CWEC) placed over a network of vertically oriented springs and generators on the coastal seafloor. The flexible carpet responds just like mud – as waves pass overhead, they induce dynamic ripples and undulations in its sprung surface, and these perturbations can be used to generate electricity. The Wave Carpet is capable of operating at high efficiency while being semi-submerged in the water column. This unique capability is survivable in storm conditions and results in no visual pollution or collision danger at the surface. In tests, the wave carpet absorbed 90 percent of the energy from waves in a tank. Solar panels, by comparison, can only capture about 20 percent of the sun’s energy. About 150m of the seafloor carpet developed by CalWave would be capable of generating the same amount of energy obtained from an entire football field that was covered with solar panels. The carpet would also remain unaffected by boats and storms because of its position at the bottom of the sea. Worldwide, some 700 million people don’t have access to enough clean water. In 10 years the number is expected to explode to 1.8 billion. The scarcity of fresh water resources and the need for additional water supplies is already critical in many arid regions of the world and will be increasingly important in the future. Many arid areas simply do not have fresh water resources in the form of surface water such as rivers and lakes. They may have only limited underground water resources, some that are becoming more brackish as extraction of water from the aquifers continues. In many places, squeezing fresh water from the ocean might be the only viable way to increase the supply. The UK startup Desolenator Ltd has developed a technology called the Desolenator that uses only solar power to purify water from any source, including sea water. It purifies water from any source with no chemicals, no filters and no moving parts. The result is the cheapest and most environmentally friendly method of water desalination. On average, a simple (1 sqm) solar PV panel has a power output of less than 200Watt per square meter. The rest of the solar energy received (1000W) is either reflected or converted into heat. It is the basic aim of the Desolenator to harvest and use both the heat energy and the electrical energy created. Water heats up on the solar panel until it’s boiling, and then the device uses the electricity from the solar panel to boil it more. The vapor is pure and safe to drink, while salt and heavy metals like arsenic are filtered out. Desolenator can help the hundreds of millions of people around the world who lack easy access to drinking water but happen to live near polluted rivers, lakes, or coastlines. One Desolenator can produce around 15 litres of clear water a day, from seawater or other “dirty” water. Seawater consists of roughly 96.5% of water and 3.5% mass of salt. Yet current desalination methods, which include thermal and membrane based technologies, focus on extracting water rather than salt, resulting in huge energy demand. The French start-up Adionics has developed a new disruptive technology AquaOmnes that removes salt out of seawater, leaving fresh water behind. The key to the technology is a proprietary ion-absorbing liquid named Flionex, which is used to bind salts. Flionex is based on a liquid-liquid deionization technology that allows to selectively remove or retain certain salts by customizing its chemical properties, remove massive quantities of salt from seawater, and lower energy expenditure. AquaOmnes spends 2 to 10 times less energy than the best current and developing technologies. With greater energy efficiency over the entire salinity range, this technology finally allows the economical use of solar renewable energy, geothermal and others. MIT team is developing an efficient shockwave-based process for desalination of water. Researches have come up with an innovative approach that, unlike most traditional desalination systems, does not separate ions or water molecules with filters, which can become clogged, or boiling, which consumes great amounts of energy. Instead, the system uses an electrically driven shockwave within a stream of flowing water, which pushes salty water to one side of the flow and fresh water to the other, allowing easy separation of the two streams. The new system is a continuous process, using water flowing through cheap porous media that should be relatively easy to scale up for desalination or water purification. Furthermore, unlike some other approaches to desalination, this process requires little infrastructure. This makes it useful for portable systems or for emergencies where water supplies are disrupted by storms or earthquakes. One possible application of the new method would be in cleaning vast amounts of wastewater generated by hydraulic fracturing, or fracking. This contaminated water tends to be salty, sometimes with trace amounts of toxic ions, so finding a practical and inexpensive way of cleaning it would be highly desirable. Recycling is processing used materials (waste) into new, useful products. This is done to reduce the use of raw materials that would have been used. The less raw material we use, the less we’ll deplete the Earth’s precious (and finite) natural resources. If we can re-use old, recycled materials instead to create consumer goods and appliances, we will reduce the amount of mining and forestry taking place. Recycling uses less energy than making a new product from scratch – even when you take account of all the related costs, like transport and wages. Mining, quarrying, logging, processing and transporting raw materials to prepare them for use in industry takes a great deal of energy. It’s far less energy intensive to reuse old materials that have already been processed and prepared – and because recycling saves energy, it also cuts down greenhouse gas emissions. 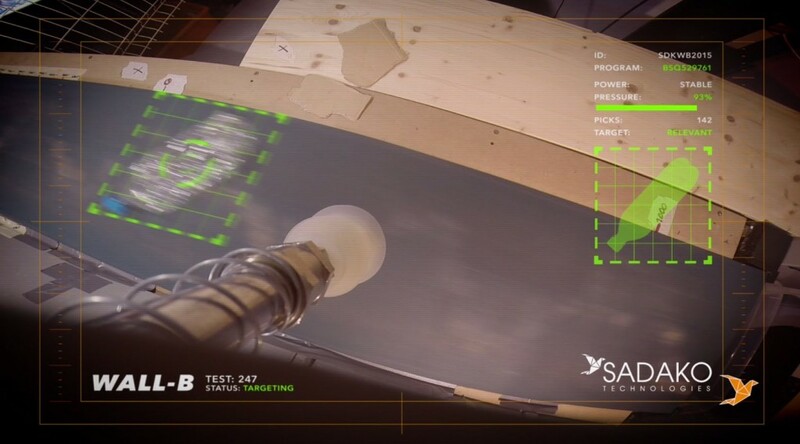 The Barcelona-based start-up SADAKO has developed Wall-B, the first automatic sorter robot for household waste based on artificial intelligence and computer vision. Wall-B is an automatic sorting system comprised of a robotic arm with a suction cup and 2D and 3D cameras, all controlled by in-house developed computer vision software. The system is able to recognise and pick up any targeted material from an on-going waste stream. Millions of tons of valuable packaging materials processed by urban waste treatment plants are lost (incinerated or land filled) each year, meaning huge economical losses and environmental damage. In most cases, losses occur because current sorting technologies or expensive manual sorting makes uneconomical a higher recovery. Dimension of the problem is immense. Only in Europe and only considering post-consumer packaging plastic, each year 7.4 million of tones of valuable material are lost. Designed to be installed in waste treatment plants that process solid urban waste, Wall-B can dramatically and cost-effectively increase recovery of valuable waste material, especially from low to mid volume streams where conventional technology has long paybacks and manual sorting is expensive, drudgery and not economically efficient. A new recycling method developed by scientists at the Critical Materials Institute, a U.S. Department of Energy Innovation Hub led by the Ames Laboratory, recovers valuable rare-earth magnetic material from manufacturing waste and creates useful magnets out of it. The process, which inexpensively processes and directly reuses samarium-cobalt waste powders as raw material, can be used to create polymer-bonded magnets that are comparable in performance to commercial bonded magnets made from new materials. Rare earths are a series of chemical elements found in the Earth’s crust that are vital to many modern technologies, including consumer electronics, computers and networks, communications, clean energy, advanced transportation, health care, environmental mitigation, and many others. Because of their unique magnetic, luminescent, and electrochemical properties, these elements help make many technologies perform with reduced weight, reduced emissions, and energy consumption; or give them greater efficiency, performance, miniaturization, speed, durability, and thermal stability. The ever-increasing global demand for new consumer electronics drives demand for rare earths, which are challenging and costly to mine. Efficient waste-recovery methods for rare-earth metals are one way to reduce demand for these limited mined resources. There are multiple types of plastic, and historically only some of them, including thermoplastics, could be recycled. A prominent type, thermoset polymers – which are used in everything from the sheathing of electrical cables to toys, Tupperware and electronic circuit boards – instead ends up in landfill at the end of its useful life. A breakthrough discovery at IBM Almaden Research Center now looks set to make this type of plastic widely recyclable, too. The reason that thermoset polymers are difficult to recycle is that the molecules contained within them are highly cross-linked. This crosslinking, which gives thermosets their desirable properties (strength, resistance to UV damage, resistance to high temperatures), also makes it very difficult to recycle these materials. The IBM team didn’t need to invent a new chemical process to allow for thermoset recycling. Instead, they just made the innovative step of applying a reaction we’ve known about since 1928 – the Diels-Alder reaction – to thermoset plastics. In this process, thermoset plastics are immersed in a bath of acid with a specific catalyst. The catalyst and the acid work together to break the bonds linking together the hydrocarbon molecules in the plastic. Once the bonds are broken, the plastic can be recycled and used to create new plastics products. New technological innovations are critical for building a sustainable energy system and tackle the negative impacts of climate change. At the same time, no single technology appears to have the potential to solve the global energy and climate problem. The issue is simply too complex to have a single solution. If we look at all the changes that need to occur to reduce greenhouse gas emissions globally, it becomes clear that a multi-technological approach is the only way forward. In order to meet our climate and energy goals we need to take a more holistic view to technological development and deployment. The answer to our climate and energy issues lies in an economically viable portfolio of advanced low-carbon technologies coupled with non-technical innovation in business models and policy. The performance of such portfolio will depend not only on the efficiency of a single technology, but on the efficiency of all technologies throughout the energy and economic system. A mix of the advanced and highly efficient low-carbon technologies will significantly transform and improve our energy system, reducing greenhouse gas emissions and satisfying our energy needs in a radically different and more sustainable way.